The revolution will not be televised. Instead, it will be baked, it will be refrigerated, it will be washed, and it will be fabulous. In 2019, appliances will trade safe and familiar for unique and bold as new technologies, innovations, and new designs promise to change the way we think about our homes. Whether it’s reinventing classic designs for contemporary tastes, or using cutting edge tech to drive connectivity and integration; manufacturers have stepped boldly into the future. This year’s hottest appliance trends redefine normal and make the past come alive in the twenty-first century. Wifi connected appliances continue to gain market share as manufacturers innovate towards a fully connected and integrated appliance suite. Bluetooth enabled technologies such as GE’s Chef Connect allow your appliances to speak to one another, providing you with the ultimate automated experience. You can also expect continued demand for operating tools like Samsung’s Family Hub (below) as internet-enabled tech becomes more and more common in the home. In addition to new innovations, Smart Appliances will continue to improve self-diagnostic tools and increase energy efficiency. Samsung’s Family Hub refrigerators have taken the home appliance market by storm and driven demand for wifi connected appliances to new heights. Easier meal planning, better family scheduling, and even entertainment at your fingertips are just some of the benefits of a connected family centre. As connectivity improves expect the Hub to take a leading role in the integration of your kitchen appliances and expanded convenience features (like automated online grocery orders) will make it a must-have in any busy household. 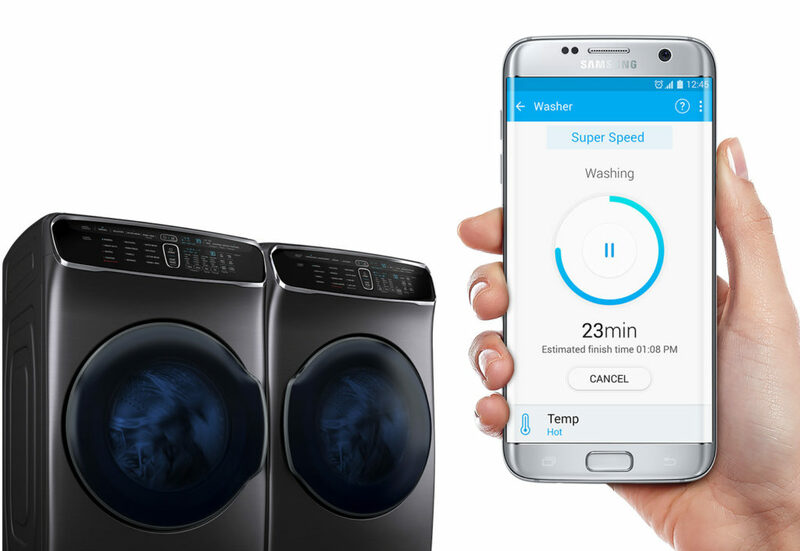 With the introduction of FlexWash and FlexDry technology, Samsung takes the lead in laundry innovation. 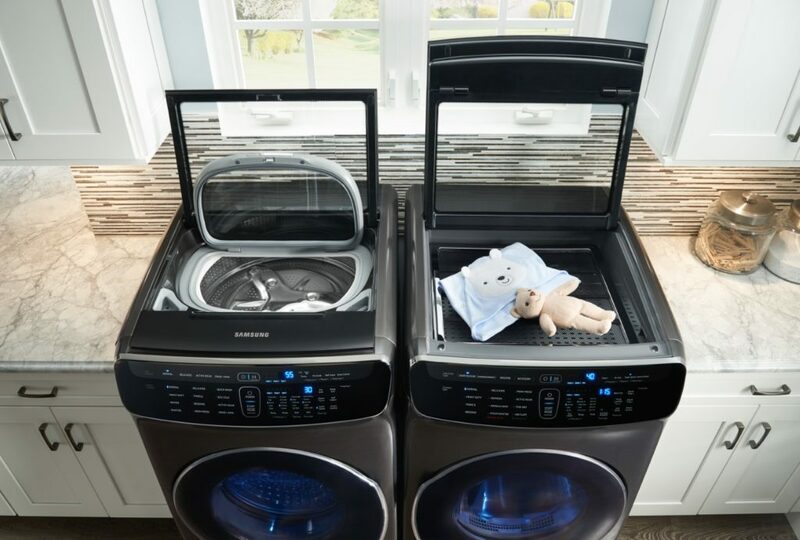 Offering up two machines-in-one; the ability to wash (or dry) two loads of laundry at different cycles, at the same time is a game changer. It’s faster, it’s more efficient and as anyone with kids can tell you, it’s a lot more convenient. French door refrigerators remain popular, but 2019 will see manufacturers continue to innovate on the bottom mount design. Flexible French-Door refrigeration continues to grow as 4, and 5 drawer models now share the market with the innovative flexible split 4-door design. Programmable and convertible compartments allow for more control, more convenience and also better food preservation. It’s back to the future in 2019 as customers continue to demand unique appliance designs and finishes that express their individuality. After nearly two decades, people are beginning to tire of the same old stainless steel, and manufacturers such as Bosch are putting bold colours back into the kitchen with removable colour panels in their Vario line. At the same time, retro-styled manufacturer’s such as Smeg continue to offer new and exciting redesigns of old classics, including bold patterned appliances that look like they’re straight out of the art gallery. Hello Dolce and Gabbana! They say everyone looks good in black, and that’s especially true for stainless steel appliances. Black Stainless Steel is sleek, chic and most importantly more fingerprints resistant than their metallic counterparts. With the successful launch of black stainless steel, manufacturers will continue to roll out additional colour variations such as bronze, slate and even white. Collapsible tines, removable compartments, and adjustable racks are just some of the ways the latest dishwashers allow you to effectively clean more dishes at once. Combined with improved wash cycles, and dedicated cleansing zones getting your dishes clean has never been easier. The most precise, safest and efficient cooking method available, induction cooking continues to expand as consumers discover the benefits of electromagnetic technology. In 2019, expect manufacturers to make bigger investments in induction cooking with more choices in ranges and cooktops, as well as an improved pro-style market with 36” induction ranges. You’ll still need induction capable cookware to get the full benefits, but look for the induction market to continue to grow as word spreads.